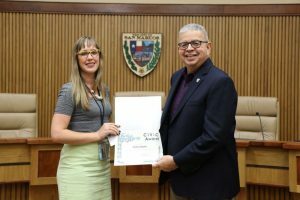 Katie Steele was recognized by Bert Lumbreras, city manager for the City of San Marcos on October 16th for her work mapping the natural area trails. Katie, GIS Analyst in the IT Department, works with park rangers, first responders and SMGA trail crew members to keep park users safe. Her trail maps are available on our website at http://smgreenbelt.org/natural-areas/ Two versions are available; a PDF for printing a paper map and an on-line interactive map for your smart device. Clicking on the lower left icon (circle below the home icon) and allowing access to your device allows you to place yourself along the trail just like in google maps. New maps will be installed at the trailheads soon to with instructions accessing the cool new navigation tool. The City of San Marcos Employee Group recognized Katie Steele from GIS – Information Technology as the awardee of the 3rd Quarterly CIVIC Award. Katie recently took on the initiative to improve the mapping of the San Marcos Greenspaces by actively GPS-ing the natural area trails before and after flooding events, adding QR codes at the trail heads to allow users to download virtual trail maps to their phone, and assisted in adding 911 address points for all trail markers.